This entry was posted in Training & education on 2016/09/30 by Susan. Teacher Raviv Boudin says it was very powerful. 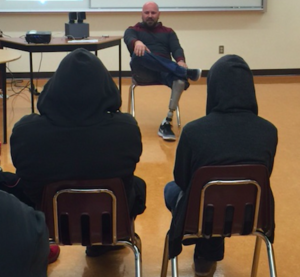 He’s describing what it was like for students to hear the story of WorkSafeBC speaker Michael Lovett, who lost his leg in a sawmill accident in 1999 when he was 18. 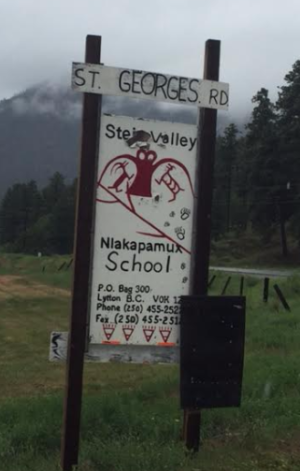 Michael spoke at Stein Valley Nlakapamux School in Lytton, BC to 25 students who also watched the video Lost Youth: Four Stories of Injured Young Workers. “He was very candid about what his life was like since then. He showed emotion, and to have him be up there as one of the representatives of the film was very powerful,” Raviv says. Michael was part of a safety team visiting First Nations independent schools in the Pemberton/Lytton region of BC. He travelled with Glen McIntosh, manager of WorkSafeBC’s New and Young Worker and Small Business team, industry specialist Helen Chandler, and WorkSafeBC safety officers from the region. This is the third annual tour for the team that aims to reach as many First Nations schools as possible. The new and young worker team did their first tour as a pilot project on Vancouver Island in 2013 in an effort to reach out to these independent schools that were not represented at education conferences for BC’s public schools. In 2016, the team co-presented their message to the First Nations Leadership Council of School District 43, where they met with students, teachers, and council leaders. “We’re able to deliver the message that you have rights and responsibilities and nobody wants anyone to get injured,” Glen says. Raviv says the presentation gave students a message that’s relevant to the workplace and beyond. Thanks to all who took the time to tell me about their involvement with this great project.